Because variable rates have historically cost borrowers less interest than long-term fixed rates (mind you, interest rates have also been in a downtrend for over 30 years). Variable rates are harder to get approved for if you have above-average debt ratios. That’s because most lenders require variable-rate borrowers to prove they can afford payments at the posted 5-year fixed rate—in case rates soar. Borrowers must generally qualify based on the much higher “benchmark five-year rate,” as set by the Bank of Canada. About 1 in 5 borrowers choose a 5-year variable, but this can change depending on the difference between fixed and floating rates. The wider the difference, the more people that prefer variable rates. Variable rates are in highest demand when the prime rate is expected to drop, and when the difference between fixed and variable rates is over one percentage point. Historically, the average difference between 5-year variable and 5-year fixed rates has been about 1.25 percentage points. 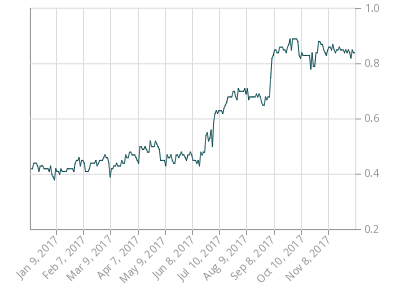 If you want to guesstimate where 5-year variable rate discounts (to prime rate) are headed short term, keep an eye on Canada’s 3-month T-Bill yield (below).